This major new textbook brings together twelve of the leading scholars of U.S. foreign relations. Each contributor provides a clear, concise summary of an important period or theme in US diplomatic and strategic affairs since the Spanish-American War. Michael Hunt and Joan Hoff provide an overview of the traditions behind US policy and a preview of things to come. Together, the contributors offer a succinct explanation of the controversies and questions that historians have grappled with throughout the twentieth century. Students will find these essays a reliable and useful guide to the various schools of thought which have emerged. Although each of the scholars is well known for their detailed and original work, these essays are new and have been specially commissioned for this book. The articles follow the chronological development of the emergence of the United States as a world power, but special themes such as the American policy process, economic interests, relations with the Third World, and the dynamics of the nuclear arms race have been singled out for separate treatment. 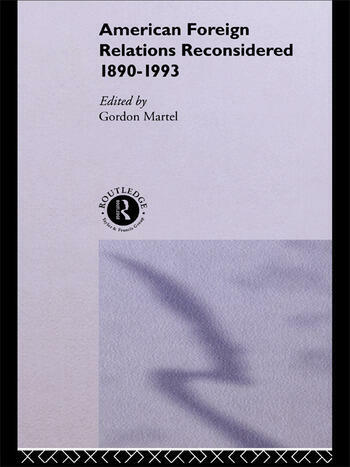 American Foreign Relations Reconsidered, 1890-1993 represents essential reading for upper level undergraduates studying modern American history. The book has been designed and written exclusively to meet the needs of students, either as a major course text, or as a set of supplementary readings to support other texts.